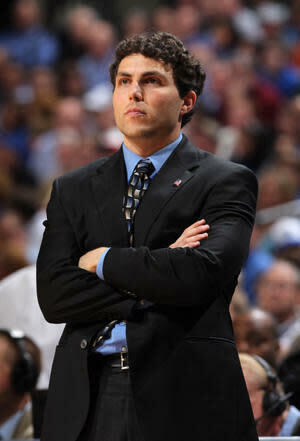 Josh Pastner may be the first college basketball coach ever to blame his wife after committing a minor NCAA violation. Late Tuesday night, Pastner used the University of Memphis' men's basketball Twitter account to inadvertently tweet "Tony Parker," the name of a highly touted Class of 2012 big man from Georgia that the Tigers have long coveted. Even though Pastner deleted the tweet minutes later, by rule that constitutes a secondary violation because the NCAA prohibits coaches from publicly discussing unsigned recruits. Asked Wednesday for an explanation for the errant tweet, Pastner told the Memphis Commercial Appeal he was trying to do an Internet search for Parker's name. He blamed the mistake on distractions from the pressures of recruiting, filling a vacancy on his staff and dealing with a pregnant wife. "My wife was yelling at me because I was on the phone too loud. I was waking (the couple's infant daughter) up and waking my wife up because I had the TV on. She was complaining that I not only woke my daughter up, but I also woke the baby inside her up because she's pregnant. "So I was waking everybody up, I was getting yelled at and on top of that I was thinking, 'What's going on with recruiting?' and 'Who am I going to hire?' and I made a mistake." While Memphis is not among the finalists to land Parker, the good news for Pastner is the violation almost certainly won't draw even a second look from the NCAA — and rightfully so. Dozens of schools each year self-report inadvertent secondary violations such as this one without punishment. That still may leave Pastner in hot water with his wife, though, depending on her sense of humor when she reads his quotes. Hopefully he's wise enough to buy flowers on his way home from work or he may be sleeping on the couch the rest of the week.